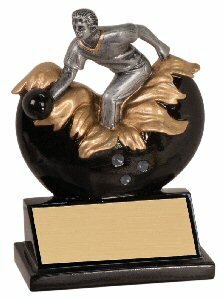 This is an exciting resin trophy sure to be a hit at your next award ceremony. The bowler breaks out of the ball in 3-D beautiful colored graphics. Three lines of free engraving on a gold plate are included to making this resin award special.